How much does Capitol Tech ask for tuition now, and how much are they going to ask for in the future? How does this differ from other colleges? Learn more on this page. Prepare money wise for your degree. Contrast Capitol Tech's fees and tuition to U.S. schools. Look for tuition trends and increases to see if you must devote more money for the following few years of paying for college. How do Fees & Tuition at Capitol Tech Compare to Other Colleges? For nationwide, regional and statewide comparisons, check out the table below to find out how Capitol Tech compares to other colleges. In the 2017 - 2018 school year, full time undergrads at Capitol Tech paid $24,788, prior to modifications for financial need. $23,988 was the price of tuition. The remaining $800 are added fees. Unfortunately, this college doesn't offer any tuition discounts to in-state students. The tuition and fee costs cited here don't include room and board, which can drive up your expenses. Yet, most students end up paying under maximum tuition because they get financial aid along with other rate reductions. The subsequent table shows the expenses explained above for the 2017 - 2018 academic year. How much does Capitol Tech cost per credit hour? Discover Capitol Tech cost per credit hour here. There continues to be a rise of 2.7% in Capitol Technology University tuition and fees for out-of-state students in the past five years. Tuition increased by 2.8% and fees increased by 0.0%. This school year, undergraduates can anticipate paying $25,455 if the growth keeps up. Because of price growth, the total expense of a four-year Capitol Tech degree would be $106,002, and the total price of a two-year degree would be $51,594, which doesn't include added expenses such as books, transportation, and room and board. 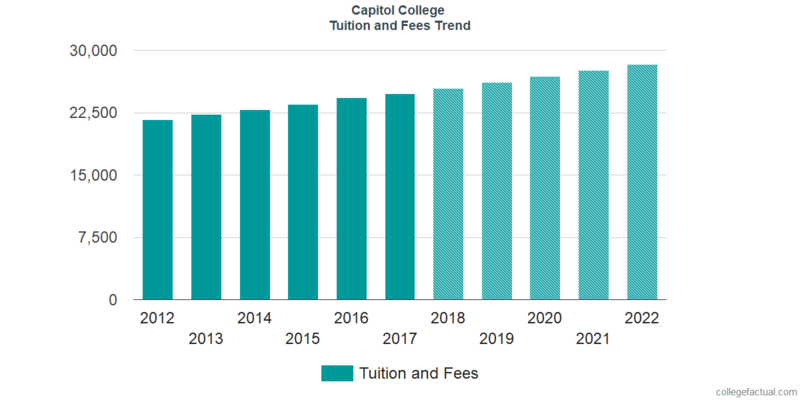 The next chart displays estimated future tuition and fees for undergraduate students at Capitol Tech. At most colleges you'll wind up paying more in your final year of school than you will in your first. This is because of yearly cost growth. It's good to be in the know!